We present the box of 24 bottles of hand-crafted blonde beer of 33 cc capacity. It is a beer of low fermentation, unpasteurized and without preservatives. Light body, very aromatic, gold color and crystalline aspect. 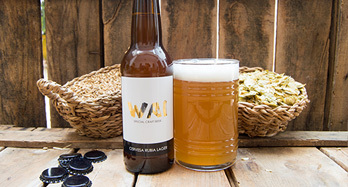 The malt, hops and yeast are of the highest quality, so that drinking it is a pleasure, with a very subtle bitterness and low alcohol content. Refreshing flavors and aromas of tropical fruits. Perfect for those moments of relaxation with an aperitif, on hot summer days, or to accompany our meals with family and friends. Maltas : Malta Pilsen and melanoid Malta. Hops : Noble German hops, American hops and mosaic hops.